Is this a traditional method of training for Tai Chi? Search me but its entertaining so enjoy it for what its worth. 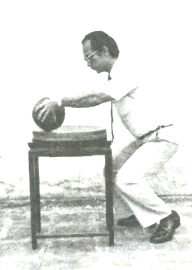 This method of Tai Chi Ball training is part of the Tai Chi Ruler system as a more advanced method for training coordination, alignment and power. This entry was posted in General and tagged taichi, taichichuan, taiji, taijiquan by Mushin. Bookmark the permalink.